A series of unfortunate announcements meant that the UK Parliament headed into its summer break with a trail of destruction in its wake. I have very little time for this blog and I was unable to keep up with the tide of depressing and controversial announcements in order to form them into a coherent post. One of the announcements was a particularly big blow; the cancellation of the Midland Main Line electrification to Nottingham and Sheffield with only Bedford to Corby going ahead. Cardiff-Swansea electrification was also ditched but for reasons I hope to explain in future isn’t perhaps as serious a disaster. I did start to write about these announcements in more depth but never finished. Some of that may surface in time, but for one reason or another there’s been several weeks without posts on this blog and for that I apologise. I cannot promise much in the way of future posts either, although a six-day holiday gave me material for a travel report series which I intend to publish in fortnightly instalments starting next Sunday. …but, thankfully, not cancelled. It appears that we can breathe a sigh of relief. The troubled programme of electrification from London to Swansea (with branches to Oxford, Bristol and Newbury) will apparently go ahead in full, despite being vastly over-budget during major government spending cuts. This news comes from the ‘Hendy Report’, the result of a review by Network Rail’s Sir Peter Hendy into re-planning Network Rail’s Investment Programme for the next few years. The majority of the Great Western electrification is now due to be completed by Dec 2018, a year later than the penultimate section (Bristol Parkway to Cardiff) was initially scheduled to complete. Swansea-Cardiff, the final section, was originally due by Dec 2018 but now will not be ready until 2019 at the earliest. The report is vague on this, and some observers have apparently interpreted this as meaning we could have to wait until 2024. They even fear that this could mean the scheme gets cancelled at a later date. Personally, although based on just one page of the Hendy report (I’ve not read the rest thoroughly), I’ve formed a more optimistic interpretation, that Swansea will be electrified in the first half of Control Period 6 (ie. by Dec 2021 at the latest). More worrying is that the ValleyLines electrification isn’t included on that page of the Hendy report. 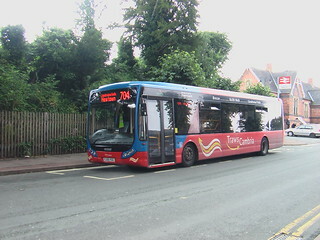 Apparently, this is because it is subject to a separate review by the Welsh Government. If this is scrapped it will be a real shame, and will mean fewer trains can make use of the Swansea electrification (the Maesteg-Cardiff service shares the Swansea line between Bridgend and Cardiff), which may lead to the Swansea scheme being scrapped if work hasn’t started by the time a decision on the ValleyLines is made. Meanwhile, the first of the Great Western’s 5-car Hitachi class 800 ‘Sardine Midget’ bi-mode intercity trains, which will replace the current 8-carriage INTERCITY 125 trains on non-electrified routes, has arrived at North Pole depot in London. Hitachi is building additional depots for these new trains, and hopefully the 9-car class 801 for electrified routes, near Swansea and Bristol. 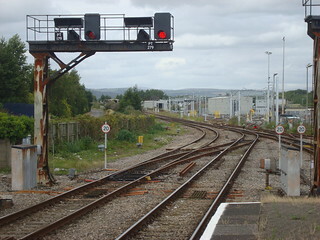 Within the Swansea depot there are electrification masts, probably the first in Wales. 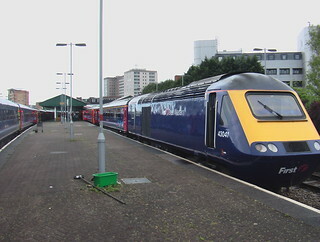 Both the class 800 and 801 trains have been procured under the Department For Transport’s ‘Intercity Express Programme’ (IEP), but it is rumoured that consideration is being given to adding more diesel engines to the class 801s, converting them to 800s, because of the delays to electrification which may mean the 801s cannot be put to use immediately on delivery.